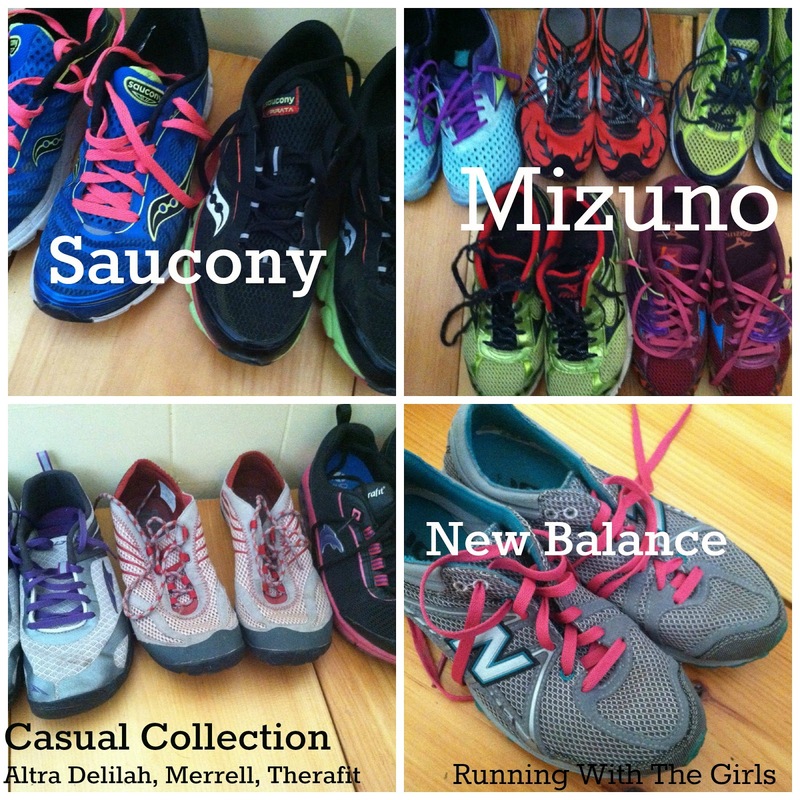 Brian at the Pavement Runner is hosting a link up today about what we have in our Fitness Closets. Because my closet isn't very large, my fitness clothing is under my bed. I have them somewhat organized, but they are definitely not folded. There is no time for that. I'm happy just as long as they make it back into the right basket. 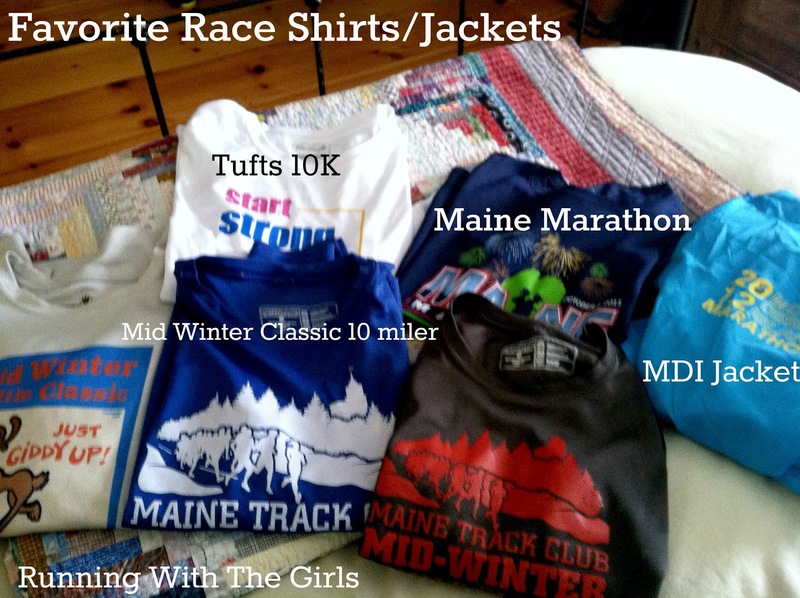 In my Long Sleeved basket - I have my favorite long sleeved race t's, race jacket, and other long long sleeved t's. 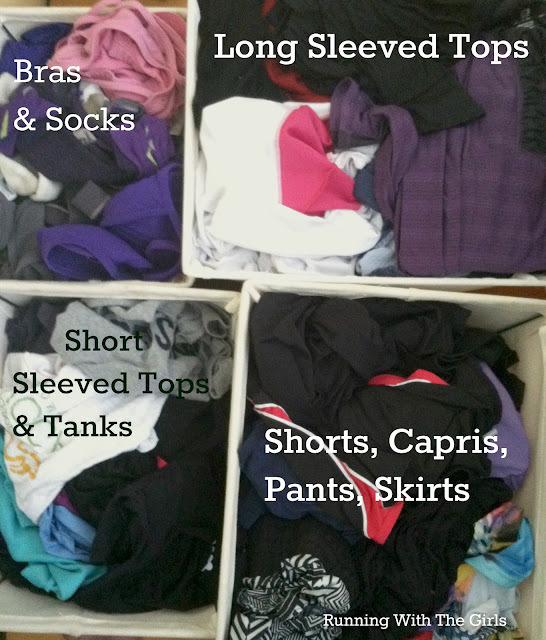 The long sleeved collection gets rotated through quite often from October to April. Then I normally pack a few away in a tote and put them in the attic for the warmer months. I will leave a few out just because this is Maine and it can still get chilly. My short sleeved and tank collection is rather slim right now because the bulk of them are in a tote somewhere in the attic. I suppose I'll have to get into the attic shortly to check out what I have in there. It's always nice to see some reappearances at the end of a long, cold winter. My shoes are another story. I need a better system for them. Right now they are in a pile on the bottom of my closet. Which is good, I guess, because I didn't realize I had this many pairs of shoes. After I took this picture, I realized I had to get rid of some. After some careful consideration, I decided to part with two pairs. I only parted with the last two pairs in the back row - my first ever racers- Asics DS Racers and my Brooks ST Racers. They are definitely done for. However, I cannot bring myself to part with any others at this time. Each shoe serves a different purpose. This isn't it folks. I still have my running jackets, gloves, mittens, headbands, hats, and other running accessories. But I keep those items downstairs by the door. That's another post for another time. I sure do have quite a bit of running clothes and I only want to buy more. I have zero interest in buying work clothes right now. I guess we all have that problem. So, dear readers, where do you keep your running/workout clothes? Are you obsessed as well? #FItnessCloset Clothing. 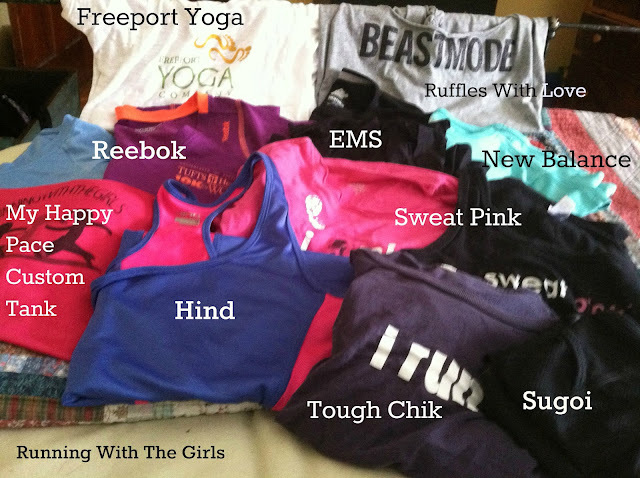 FitFluential Gear Under My bed What's In Your Closet? Love this! I still have a ton of stuff at the old house that needs to be moved so I'm not wearing the same thing over and over again... But my Maine Marathon shirt is by far my favorite long sleeve and I think I'm going to have to invest in some new summer stuff. Being still pretty early in my "collection", I have one drawer in my dresser that has most of my running/biking/swimming stuff. It is getting a bit out of control and I'm going to have to come up with a better storage solution. 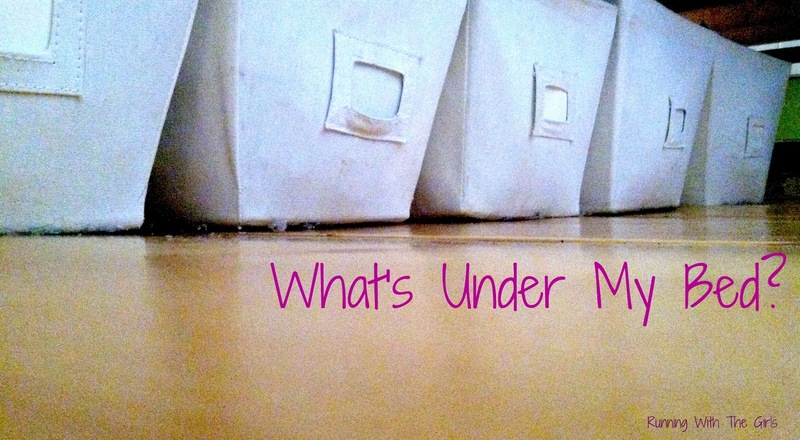 I've actually been thinking about going "under my bed". I only have one pair of shoes though (plus bike shoes). I'd love more! LOL about them all being under your bed. I like the bins though! I totally need to get rid of some shoes! I like your bin system! I recently did a shoe purge. Not sure why it's easier for me to get rid of shoes than it is clothes. I still have plenty of shoes though. I keep my running stuff in a milk crate that I store on a shelf in my closet. Sadly (or maybe not so sadly) I've outgrown my crate and my running clothes are slowly taking over my closet. I'm pretty good about keep my shoes stored in their original boxes which are stacked up in the corner of my room. Every time I go to shop for work clothes, I end up coming home with fitness clothes. It's a sickness, I tell you. I am totally obsessed with buying running clothes! I really need to buy some work clothes, but I always end up in the fitness aisles! I have my clothes in a few drawers and hanging up, I want to take out a sink we dont use and replace it with a "running closet" right across from my vanity! I think that is my new plan, excited! About 3 days ago I was slightly embarrassed to tell people how many pairs of running shoes I have. Not so anymore! I have A LOT and I love them all. I love workout clothes but hardly ever buy them. Its always the same 4 Old Navy workout sets I have (sometimes with just a pair of yoga pants and a TShirt), the one pair of Saucony's I have (I have walking shoes too...Adidas and Nike) and then my Tommie Copper compression sleeves. That's it! Lame huh? Love all of your clothes! I have all of mine on the floor of the room where our bird's cage is (we keep the door shut because of the cats). I have a TON of clothes! I wish I had been prepared for this post because I would have joined in the fun! Great variety - I haven't branched out much with my winter gear, but more with my warm weather stuff. Awesome collection... i love seeing all the different shoes. You totally need them all. yep. all of them. Great colors as well. Thanks for joining in on the fun. Your under the bed post is amazing! I may have to adopt your system when I outgrow my closet because my running clothes just keep expanding. Also, I want all those shoes. 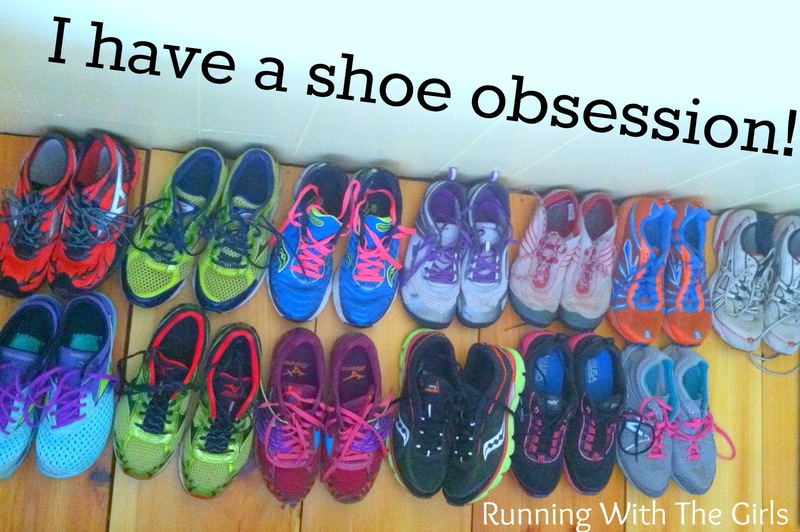 I love my runners and want to buy NOTHING else! Wow! That is a lotta shoes, Girl... love the little bins, such a good idea. The bins are a great idea! I may have to try that myself. 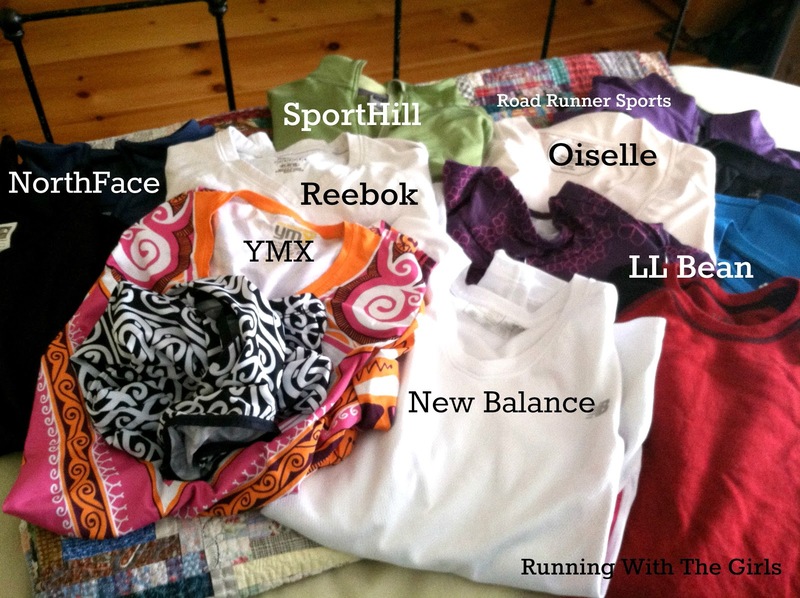 Running clothes don't really need folding, right? !